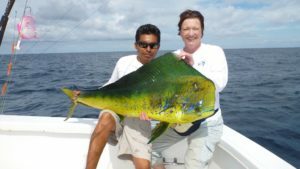 You may have read or heard about the awesome sailfishing, plus the marlin, dorado, roosters and yellowfin tuna fishing in Guatemala. It is relatively routine to raise 20 bill fish a day, and land around half of that. But sometimes you can do many more. This skipper’s best until 2017 was 64 sails to the boat in one day! Probably meant he raised over 100 fish that day. NOTE: In January of 2017 they actually caught 84 sails in one day! Next day he did 50; and the third day of the trip for the party from Wyoming was 33 fish landed! 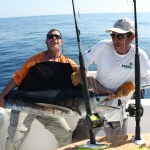 That party of 3 guys landed 167 sailfish in 3 days! Then it slowed down to the normal 12 to 25 per day! Many places would give their eyeteeth to raise even 10 sails in a day, never mind actually land that many! I (Butch) went down here the first few days of February 2017. We had three couples, so 6 in all fished. We hit some very unusual weather which hurt us somewhat, but we still managed to raise over 40 sails in 3 days, landing 19 plus one 55” long mahi-mahi. Great people, an awesome fishery, and with food, open bar, nice lodging and 3 days aboard a 31” sport fisherman, — we did it for only $1510 per person!! Absolutely incredible pricing for this fishery which is still in its infancy. Our best sail was estimated to exceed 120 pounds. Marlin can exceed 500 pounds. This operation is currently small with two skippers, but the host and owner is an ex-Navy Seal and holds a 10,000 ton license, and the other is a world famous mate who has just been granted the captaincy of the second boat. So you get two top notch skippers who understand blue water trolling, and also understand how to flyfish for billfish, as well as use conventional tackle. This is high-success fishing with lots of adrenaline! And they can even cook your catch for you right on board – talk about fresh fish! Lonnie G We chose this operation for a family fishing experience and in anticipation of an upcoming birthday. Two in our group had some special dietary/health needs and they confirmed they would be no problem before-hand. The owner and his staff went over and above every day to meet our needs. 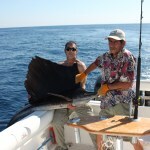 The fishing is great – we caught 86 sailfish in three days and two in our group were novices to this type of fishing! The lodge is set in an idyllic location, clean and the food was fantastic, especially the pineapple and mango snacks on the boat! They even made a special birthday cake and sang for our birthday celebration. We hope to make this journey again and cannot thank them enough for a five star experience! Put this on your bucket list. Shawn T. This was my fourth trip. His new place on the island is great and the pool couldn’t be nicer at the end of the fishing day. The accommodations are fine and the food is amazing! His crews are some of the best in Guatemala. 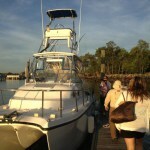 Six of us fished on two boats raising over 120 sail fish in three days. we caught over 20 on the fly rod and a few more on spinning gear. Can’t wait to head back down in October…. So if you are an experienced angler – or a novice blue-water fly fisher, male or female- they will coach and coax you through the process, and you will catch fish- and big ones indeed. Or fish conventional tackle if you and your group prefer that. They supply all the tackle, including the fly rods and flies and top notch conventional tackle too (Avet, Penn). A couple of years ago the owner of this operation added Kennedy Hernandez to his team as the Captain of their latest addition to the boat fleet, which is the another classic Bertram 31 Fly Bridge, named the Typhoon. We fished this boat personally, as well as the second boat. We were very impressed with the quality of the tackle and how hard the two mates worked to keep things changed up and working. This Skipper is an experienced blue water fisherman, and as a licensed Captain with almost 20 seasons “on the rod”, Kennedy stands apart from his peers and has experienced a productive and distinguished career at the helm. During Kennedy’s 17 seasons with Brad Phillips on the Decisive, upwards of 30,000 billfish were caught and released, and Decisive led the pack at the port of Puerto San Jose with the most releases for the past 10 years, including a First Place win in the 2014 PCCA tournament. Along the way in the Guatemala and Cape Verde Islands waters, Cpt. Kennedy picked up a couple of “Granders” – Blue Marlin exceeding 1,000 pounds. His expertise and ability to “think like a billfish” earned him the honor of not only being featured on the cover of Saltwater Sportsman, but also got him a nomination as “The Best Mate In the World” by Marlin Magazine! A fluent English speaker, Kennedy said, “I’m looking forward to working with this operation, and leading our team at the helm of the Typhoon. Aside from being probably the world’s best destination for Sailfish, there are more “Marlin Granders” lurking out there in our Guatemala waters…and I know how to put billfish on our customers’ rods.” When he’s not on the water, Kennedy enjoys time at home with his wife and two lovely daughters. If you are looking for a guide to put you on the billfish then Kennedy is your man and this outfit proudly welcomes him to their team! WHEN? In terms of when to go, there is excellent Sailfishing from October through April, giving you many months of prime fishing. 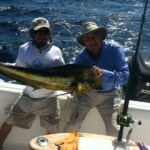 Marlin are good fishing most of the year, except for January. 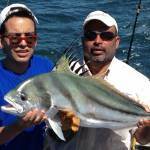 Yellowfin is good most of the year, as are Wahoo and King Mackerel. Rooster fishing is best in June-August, slow in Sept-Nov and April to May. You can go almost anytime and find good fishing. Having read over 50 references, there is absolutely no doubt that this operation is a must do for any blue-water fishermen, fly or conventional. And there is a wonderful Villa to live very large in, complete with pool and awesome food. It has 6 bedrooms, 4 baths, and all meals are cooked onsite by a chef. You are on a small island, with water in walking and viewing distance. It is fully air-conditioned. LODGING: Accommodation is in a large 11-bedroom and 8-bathroom villa in a gated community in town, complete with pool, air-conditioned rooms, and awesome food cooked onsite. Depending upon the size of your group, you may be sharing the villa with another group. NOTE: The villa does not have hot water, so showers are cool. Refreshing, but not warm! Who cares when the fishing is this good! TRANSPORT: Fly to the modern La Aurora International Airport in Guatemala City for pickup. This pickup and return cost is included in your package. We found flights from LA and Miami in the $400 to $550 range. PRICING: You’ll pay about 50% less here than you would at other local fishing lodges!! [All prices are per person] NO MINIMUM PARTY SIZE- ONE PERSON IS FINE. *Daily Rate : Only includes lunch and beverages. This is simply a day of fishing on the boat- not a package. PACKAGES INCLUDE: Transportation; Pickup from La Aurora International Airport (GUA); Local travel; Return to airport for departure; Meals (Breakfasts at villa, lunch on boat with soft drinks and beer, chef cooked dinners. Also included is your Fishing; your Tackle; (includes bait); First “fly” free for Fly fishers. FISH LICENSE IS ALSO INCLUDED! Lodge has a cell phone for use with 90 minutes US call time; a laptop with Internet connection; and wireless internet for any Wi-Fi devices. KEEPING FISH: Bill fish are not kept. But mahi, tuna and others can be kept, frozen, and packed into your cooler to take home. No charge for the prep. Not Included: Tips for mates (Usually a total of $50 per mate ($100 in all) split among those on board.Captain normally gets $100 total, split by those on board. Kitchen staff- $75-!00 split by the group. Outfitter thinks his prime season is November thru May.